Kevin’s First Novel Is Getting Popular! The reviews for Kevin’s first novel, Borrachon, continue to come in and they are all very positive. This is Ulysses Media’s first publication and we are working on rolling out more books soon. We are currently looking for new authors looking to be published. Regarding Borrachon, it is a prequel to the Rio Bravo story and film provides the complete background leading up to the classic tale. The book gives rich backstories to Sherriff John T. Chance, his deputies, Dude and Stumpy, as well as introduces new, colorful characters worthy of Western writers like Larry McMurtry, Louis L’Amour, and Zane Grey. The novel is filled with excitement, humor and intrigue and will leave the reader with a deeper appreciation and understanding of the Rio Bravo story itself. I have said it for years, “Given an unlimited budget, a monkey could be a CMO.” It is easy to get a publication to cover your product if you wave a bunch of greenbacks to its advertising sales team. Even those pubs that pride themselves on journalistic integrity cannot completely ignore the bottom line. Pitching a story on its own merits to a journalist involves work, and includes researching the current issues facing the specific industry you are in; knowing the types of stories the targeted publication covers; and crafting a succinct, relevant, news-worthy synopsis of the story. I am not opposed to outbound marketing and realize that it has its place. Publications, both online and print, need those advertising dollars to survive. However, if an article is merely an extension of that full-page, four-color advert of your company (very often found facing the article on the opposite page) both the piece and the publication become tainted. If pitching a story in accompaniment of an ad, ensure that the story is about an industry issue that your product or service addresses. In fact, insist on it. The journalist should appreciate not having to write a puff piece on your company. It shows respect for the craft and the journalist may find it totally refreshing. Or faint dead away from the shock. And while I’m at it, the same can be said of trade shows. A company can spend on the largest space, sponsor meals and side events, in order to get a speaker slot. If that speaking opportunity, whether it is as a sole presenter, panelist or moderator, becomes an infomercial for a company and its products, it reflects poorly on the company as well as event organizers. As in pitched stories, keep the presentation topical. Very few companies have the bandwidth to maintain a large trade show presence while delivering a compelling industry-based presentation during attendee sessions. The marketing budget is the easy part. It’s the industry insight and presentation skills that are hard to come by. Today’s CMO, especially for small- to mid-size companies, must not only possess marketing skills but a deep knowledge of the industry the company services, and well-developed relationships with a long list of journalist and analyst contacts. These relationships, if based on mutual respect and with an understanding of the role each of you plays in the industry, can generate rewards. Spontaneous rewards. Rewards that do not impact marketing budgets. Being called, unsolicited, by a journalist to weigh in on an article (or an analyst on some research piece) is the result of cultivating good, professional relationships. What crucial trends are driving the industry? In my opinion, the major current trends are continuations of the issues that have driven the industry over the past few years. The reasons behind regulatory reform following the financial crisis, namely higher transparency for end-investors and risk mitigation for both the buy- and sell side, are still being addressed. It can be argued that the regulations themselves were developed largely based on the need for reform with less thought on the methods for implementation and compliance. However, the issues of investor confidence and systemic risk were highlighted. Whether or not these new regulations are repealed or tempered in the future – such as Dodd-Frank in the US – banks and asset servicers should continue to develop best practices around increasing transparency and decreasing credit and operational risk. By doing this, opportunities for new and improved value-added services may be established, as well as a reduction of operational costs as more automation is introduced into what were traditionally considered manually intensive operational procedures. The industry should proceed as if full compliance with the regulations is firmly in place. Addressing big data in the financial industry is another continuing trend. As in psychoanalysis, identifying the problem is the first step, and when it comes to data, this has, at least, been accomplished. Not only have financial firms realized the vast amount of data that regularly comes into their organizations but they have also found that much of it is duplicated. In larger firms, there may be separate licenses for the same data across the enterprise. Many firms have gone through the exercise of reviewing how that data is being used by various departments and entities. Some have even made the effort to source its own data. Take, for example, the initiative formed by J.P. Morgan, Goldman Sachs, and Morgan Stanley to jointly create their own reference data company, SPReD. Using this consolidated data, the industry is developing new ways to use it. Much like the fields of science and marketing, the financial industry will continue to build applications for predictive analytics and data curation, creating opportunity and streamlining operations. While outsourcing has been around for quite a while, the use of the cloud and SaaS models in the financial industry will expand the availability of these infrastructures. The security of the cloud no longer seems to be in question. Some hedge funds have opted to place their operations, including positions and trading information, to third-party SaaS providers. There was a time when this would be unheard of, as that information was considered vital (and highly secretive) to a hedge fund’s strategy. Another major trend is the emergence of cryptocurrencies, now going into its second generation. The adoption of Bitcoin as a currency/commodity in various markets, in spite of its sometimes volatile track record, is an example of this growing trend. The database that tracks the Bitcoin trades, blockchain, is a disruptive technology in itself. Initially, the currency avoided the use of banks, thereby escaping the scrutiny of regulators. However, as more financial firms start to trade and hold positions in Bitcoin, regulators will be required to get involved. The security, stability, and speed of transaction of cryptocurrencies in general – and Bitcoin specifically – have yet to be fully addressed to the satisfaction of established markets. What market segments will experience the most growth and why? In addressing the trends, there is opportunity for all players, not only the buy- and sell-side firms, but for application and data solution providers. There are many start-up technology companies offering innovative solutions for risk analytics, integration, data mining, and support for alternative trading. This past year, the industry also witnessed consolidation as larger providers acquired niche development firms with innovative solutions, as well as established vendors, to bolster market share. Vendors of all sizes that offer advanced solutions in these areas should benefit from the growing demand. The larger vendor firms are also offering managed services platforms with broader functionality, running on traditional as well as SaaS environments. The market for outsourcing and Business Processing Outsourcing (BPO) services should continue to expand. According to a study by Broadridge Financial Solutions, “Charting a Path to a Post-Trade Utility”, outsourcing core post-trade processing could reduce a financial firm’s operational cost by 20% to 40%, and overall, could save the industry up to $4B annually. As evidence of this growing market, it was announced this past August that FIS, one of the largest outsourcers of financial processing, acquired the financial solution provider, SunGard, bolstering not only the former’s market share but expanding its scope of product offerings that could eventually be ported to a hosted platform. In the area of data, another large acquisition this past year is indicative of the market potential and increased activity in information delivery and processing. Intercontinental Exchange (ICE), a firm that operates a global network of exchanges and clearing houses, acquired financial data provider, Interactive Data Corporation, for a reported $5.2B. Given the exploration by financial firms in developing new methods for how data is utilized, acquisitions and consolidation within the data provider segment should continue into the near future. If certain financial regulations are not enforced or are retracted, financial firms should continue their efforts to reduce risk and increase investor transparency as if compliance was required. It has been shown that the amount of disclosure to the investor is in proportion to market efficiency, as well as the performance of individual stocks. Proceeding with compliance, whether mandated or not, will be a challenge in itself. Regarding internal and systemic risk, building necessary functionality within applications benefits the industry overall. On the technology side, this requires improved design for risk processing, including the introduction of new weighting factors, automated analysis of historical trends, and interrogation of data across disparate sources. To address transparency, a secure infrastructure would have to be established in order for investors to access additional information. In dealing with disparate data sources, integration is key. There are many start-up technology firms who offer innovative integration utilities. Some of these employ an “anything in/anything out” approach that can assist organizations in mapping sources into a single, normalized layout. However, there is also something to be said for standards. ISO 20022, for example, uses an XML-based methodology to not only design a standard format but to also build a global set of business-based terms and logic. Take-up of the ISO 20022 approach can be seen in global and domestic payments, securities operations, and trade finance applications and will continue to expand into other financial processing areas. When considering outsourcing its operations, a financial firm must obviously perform its due diligence. Typical exercises such as cost-benefit analysis, reporting procedures, regulatory compliance, end-user access, are standard. When selecting a vendor, a firm should not only ensure that the proper certifications are in place, but that all the required functionality is offered. Beyond functionality, integration across various operational processes should be reviewed. Some outsourcing vendors have the depth of functionality but not all have the proper level of integration across applications. The introduction of new currencies, such as cryptocurrencies, requires flexible data models that can be expanded to create new elements such as positions, update client static details, and populate enterprise-wide reporting. Since the introduction of the Euro, many core applications have this flexibility. However, cryptocurrencies, with their current lack of regulation, non-traditional payment protocols, and extremely high levels of volatility, have unique requirements beyond those of globally-accepted currencies. Flexible data models are also useful when developing new risk models and normalizing data across disparate sources. There is a part of me that is constantly on the hunt to apply the works of poets to the business life. I think Emerson’s quote is one of the most directly applicable ones I have ever come across. Sure, I could always stretch-to-fit something from my personal favorites go-to-guys, W.B. Yeats or Emily Dickenson, but I found this to be of particular interest, especially in the matter of mentoring. I have been asked many times about my own approach to mentoring and managing others. When I reflect on it, though, I have found that in almost every case I have invariably gained knowledge from interacting from colleagues across levels and departments. I like to think that I was able to bestow some insights to each of them as well. Lately, I have been reading about this notion of the worth of the individual and have found it has support from such historically opposing sources as psychotherapy and religion. In Cognitive Behavior Therapy (CBT), psychologists strengthen the patient’s self-esteem by stressing that they incorporate positive feelings of his/her own self-worth. Both of the comparative concepts of inferiority and superiority can be harmful to one’s s psyche. In religion, Judaism stresses Man’s equality under God, and Christianity emphasizes that all human beings are lovable in the eyes of God. Buddhism actually goes beyond this idea of equality to state that the concept of “self” is mythical. I will quickly cross over to the secular side of the street here to avoid becoming dangerously close to sounding too pious. My point is, however, to be conscious of how you interact with co-workers from any level. Coming off as superior could not only damage their self esteem, but you may also miss an opportunity to learn something. It could also be bad for your Karma. The term “Marketing Content” seems to be all around us. It’s not a passing fancy nor, as Cole Porter once wrote, a fancy pass (sorry, I couldn’t resist). Marketing Content is the way many companies now support their core values, mission statement, and messages. It can be considered the expansion of these long accepted marketing pillars. If executed correctly, it can not only create new business but it can reinforce the buying decision made by a company’s existing customer base and create opportunities for thought leadership and stronger brand awareness. In marketing terms, content has become King. Calloused by direct sales pitches, buyers — both consumer and corporate — have become quite clever in avoiding advertising. Whether by using DVRs to skip commercials, clicking on “No, thanks, continue to site” on web pages, or by sending cold callers directly to voice mail, buyers are making marketers earn their money. I believe that this development, in itself, is a positive step forward. The ways in which to say “We’re the best” have all been explored by now. What is required today is demonstrating actual market differentiators by speaking the language of the target audience. The best marketing content does not come from the CEO or the visionaries who founded the company. While their input is vital to high-level corporate messaging, compelling content resides in the souls of those who are providing the goods and services for the company. A good content editor can mine these pieces of marketing gold by nurturing and encouraging input from staff. A good example is a financial technology (FinTech) company whose product teams are building business specifications for new solutions. These are the Subject Matter Experts (SME) who speak the language of the industry they are serving. Any blogs, papers or articles from this groups are considered peer pieces. Not only SMEs, but developers, support staff, business and technical analysts can be prime sources of content. A content editor should be able to ask the right questions, extract the salient points, and create, at the very least, a thought-invoking blog. The better editors can build this from just a set of bullets provided by a team member. I’m not saying this is easy. For some, the content editor will be viewed as a demanding English teacher tapping her foot for the assigned composition. I’ve found others, however, who were thrilled by simply being asked, allowing their inner Hemmingway to come out. For those many firms who include “our people” as a distinct market differentiator, using staff as a source for marketing content is almost a litmus test of that very claim. Before approaching any staff for content, a clear marketing content strategy must be defined. The strategy comes filtered down from the top to support corporate messages and core values. The content is comprised of the finer points that add up to a corporate culture. The strategy should include an editorial calendar, similar to that of any publication. In fact, the content strategy can be considered a corporation’s entry into self-publishing. If done right, content marketing can be a powerful tool for generating new business and raising a company’s profile. Being one of those often looked-down-upon subway alumni of Notre Dame, I find myself constantly tracking news of the university, whether it’s the highly publicized triumphs and defeats in football, the great and near-great achievements of women’s basketball, the highlights of men’s hockey, or even lacrosse victories. So it was with a particular sadness that I read about the passing of, arguably, the university’s most famous and successful president, Reverend Theodore Hesburgh. Father Hesburgh, besides elevating Notre Dame’s academic reputation, championed (“champion” being used here in its truest sense) the rights of the poor and mistreated, as well as world peace. He was an advisor to six presidents and served on sixteen presidential commissions. He was even fired by Richard Nixon, a fact, I think, that helps to cement each of their respective historical standings. A lesson primarily aimed at morality? Agreed. But I think, whether intended or not, it can also be aptly applied to business decisions. Too often, a corporate decision to invest, acquire, expand, is based on what is easiest, cheapest, or most popular. It may be based on internal political maneuvering, or the efforts of external parties with self-serving influences. More often than not, the easy, cheap, and popular decisions cost more in the long run. 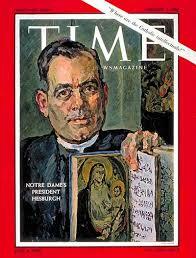 For more information on the life of Father Hesburgh, you can visit the page on the Notre Dame web site. 1) Employee Productivity: the general assumption is that access to social media sites diverts an employee’s attention away from the work at hand. However, several studies, including one conducted by Robert Half Technology, prove just the opposite. Research strongly supports the premise that for each hour an employee spends on a non-work related website, more than that hour is spent on constructive tasks outside of the workplace. A common example of these tasks would be the checking and responding to e-mail messages during commuting times. In general, the work gets done (otherwise, there exists a distinctly different employee issue). 2) Bandwidth: open access to the Internet puts undue stress on a firm’s technical capacity. According to Ashley Wirthlin of BusinessTraining.com, bandwidth “is the paper of the digital age.” Back in the day, it would be unheard of for a company to tell its employees that correspondence — both internal and external — was solely dependent upon the amount of paper on-hand. As the cost of disk storage and servers continue to drop, this is no longer a valid argument. 3) Security: openness to the Internet allows for hacking, as well as viruses and malware. One of the key responsibilities of any IT department is to secure its networks and systems with firewalls, encryption, and valid deployment of Secure Socket Layer technology. It is almost a given as a Day One task that system security be established and maintained, regardless of the source of possible threats. It is being done now by those firms who allow social media access by their employees. 4) Employee Recruitment: I would think that today’s graduates would insist on access to social media in the workplace, as it is part of their DNA. Minor case in point: the other day, my 14-year-old daughter broke the screen on her iPhone and, realizing the social impact of her non-connectivity — the social equivalent of my being sent to school without my Man From U.N.C.L.E. lunchbox — I immediately went to Apple to get it repaired. An indulgent father? Perhaps. 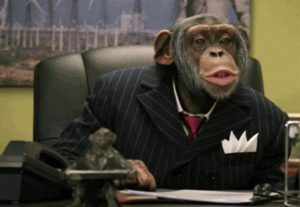 But I think my action was due primarily to understanding the importance of being connected in today’s world. 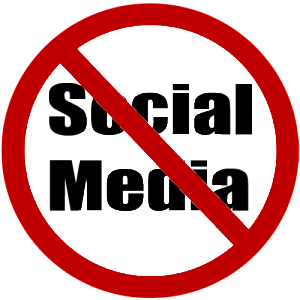 In regards to recruitment, lack of accessing social media may turn off a strong candidate and have him/her look elsewhere. Such as the competition. 5) The Personal Power of Mobile Technology: following up on the last point, most people have access to the internet via their mobile devices; they can access any site via their phones or tablets without the aid of the company’s network. Why not, then, allow access via the organization, making each employee an advocate and evangelist for the firm? The parameters for such interaction between employees and the digital world are set via the firm’s published and agreed Social Media Code of Conduct Policy.